Defying the need to fit neatly into a traditional segment, a growing number of coffee shop concepts are adding cocktail bars. These restaurants are seeing benefits by serving beverages during different dayparts and to different types of customers. And they’re tapping into patrons’ passion for the nuanced flavor profiles found in both coffee and cocktails. While these operators might not get enough sleep, the dual revenue stream is helping them keep business brisk from day to night. For Ryan McKenzie, who opened Patent Coffee and Patent Pending earlier this year in New York City, the dual-concept space was always the goal. At Patent, the 1,200 square-foot space is split in two, with a slightly smaller coffee concept in front and 34-seat cocktail concept in the back. The coffee shop space closes before the cocktail bar opens for the night. But many spaces combine the two concepts, like Nomads in Kansas City, Mo., which opened in October 2017. Here the location ­— near a hospital — helps bring in customers with erratic schedules. Although both coffee and cocktails flow during the evening hours at Nomads, Park does raise the music, turn down the lights and add candles to set a more intimate vibe. Nomads sells about the same amount of coffee drinks as cocktails, said Park. Kobrick Coffee Co. Cafe in New York City also utilizes the same space for its coffee shop and bar but makes changes to set the evening tone. A curtain helps ensure that customers coming in for a latte to go don’t disturb customers sipping on cocktails. Many of the cocktails at Kobrick incorporate coffee and are made using coffee-making equipment. Kobrick opened in 2015 before many of the other coffee shop-cocktail bar hybrids. Kobrick Coffee Co. is a nearly hundred-year-old coffee-roasting company, and co-owner Scott Kobrick said the family-owned business was looking for a “showcase” for their product. Adding cocktails to their coffee shop was a natural fit. Making both requires craft and skill after all, Kobrick said. Coffee and cocktails weren’t enough for Trust in St. Louis. This business could really be considered four concepts in one. The coffee shop, cocktail bar, co-working space and event space opened in early March and is a partnership between Covo, a co-working company, and Artisan Well, a group that has created beverage programs for bars around St. Louis. And drawing customers into Trust has helped build Covo’s membership, said Brian. 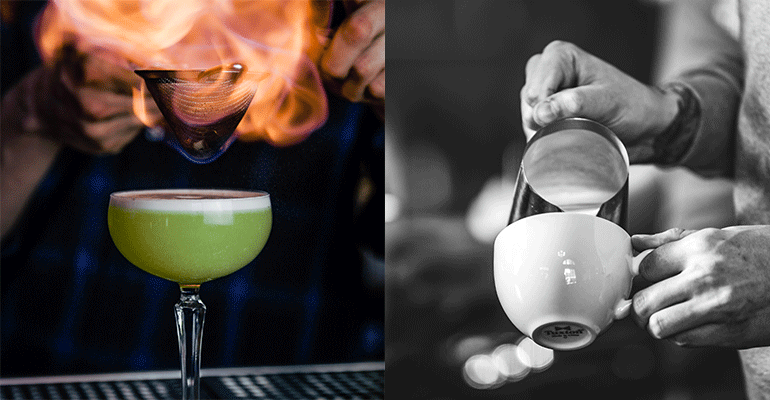 More established coffee shop brands are also considering cocktails. Foxtail Coffee, which has two locations in Florida and two more on the way, recently added the Farmhouse, to their Winter Park, Fla., location, where the company is based. The Farmhouse is an extension of their traditional coffee shop, which features coffee roasted on site, the world’s largest coffee siphon bar, and yes, cocktails. This location taps into another popular trend — cocktails on tap. According to Brian of Trust, cocktails are a smart addition to a coffee shop as they can help business grow faster. Currently a majority — about 75 percent — of Trust’s revenue comes from cocktails. For one thing, the average bar ticket is a higher: coffee drinks cost about $3 while cocktails can cost as much as $13 at Trust. But Brian has also found that consumers are habitual when it comes to coffee consumption.